Google has 10 Samsung Galaxy Nexus’ up for grabs over the next 10 days. You want one? Well it is quite simple, follow @GoogleNexus on Twitter and enter each and everyday by answering the daily question or puzzle. Once you reply via Twitter, sit back, relax, and pray. However, there is no need to rush because the event starts tomorrow (November 12) at 9am Pacific Time. Remember when I asked you what you do to pass the time waiting for the Galaxy Nexus, well I just gave you another (and exciting) option. Best of luck and be sure to check out the official rules. 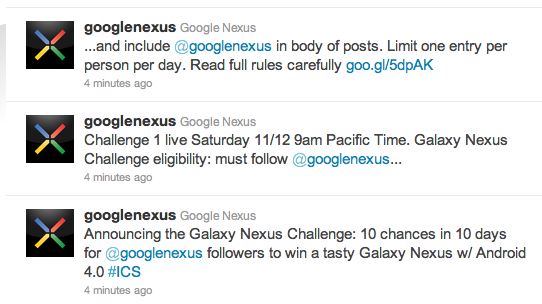 Interestingly enough, the contest runs until November 21, perhaps up to the release date of the Galaxy Nexus? Galaxy Nexus Talk: More Verizon Training Info, Potential Retail Price of $500, and A Release Date of November 21?